Fibular Grafting and Impaction Bone Grafting (FAIBG) is a type of minimally invasive hip preserving procedure with stable clinical curative effects and a standard operation procedure. However, FAIBG requires a difficult technique and a series of complex procedures. Therefore, the discovery of a new methodology for surgical guidance that could lead to accurate, safe, easily performed surgeries will play a crucial role in the promotion and application of FAIBG. From September 2013 to July 2014, one surgeon performed FAIBG on 10 patients (4 males and 6 females) with an average age of 40 years (range, 35-50 years) using patient-specific surgical guides. All patients underwent preoperative X-ray examinations and CT and MRI scans. Before surgery, we performed preoperative planning with patientspecific surgical guides by Computer Aided Design (CAD), and the length of the bone tunnel; bone mass, percentage by volume, and percentage by surface area were measured. After surgery, ten fibular allografts and screws were placed in 10 patients diagnosed with ARCO II FHN. All implants were successfully placed using patient-specific surgical guides. After the application of the patient-specific surgical guide, the operating times were 53-75 min (average: 68.6 min), the blood loss volumes were 90-150 ml (average 120 ml), the operative incision sizes were 5-7 cm (average 6.4 cm), and the mean hospital stay was 13.2 d. All cases were followed up for 12 to 30 months (average: 20.4 months). In conclusions, patient-specific surgical guidance may enable more intuitive and precise preoperative planning for hip-preserving procedures. Patient-specific, Surgical guide, Impaction bone grafting, Fibular grafting, Preoperative planning, Medical image. Femoral Head Necrosis (FHN) is a debilitating disease that usually leads to Femoral Head Collapse (FHC) and the destruction of the hip joint. FHN is an intricate and unsolved problem in orthopaedics. Once FHC occur, Total Hip Arthroplasty (THA) is inevitable. Although THA is beneficial for patients, some issues regarding its invasiveness and poor prosthesis durability remain. For the majority of patients who undergo THA, THA revision is required within 20 years . Therefore, a hip-preserving treatment would represent a significant advance  in the early stage of FHN. Several hip-preserving treatments, such as isolated core decompression, fan-shape decompression with fibular auto-graft and free vascularised fibular grafting, have been developed to protect self-head of FHN patients. However, isolated core decompression could not recovery the biomechanical environment and show limited success in preventing FHC. Fibular auto-graft is often associated with serious trauma, high complication and longer recovery time. Fibular Grafting and Impaction Bone Grafting (FAIBG) is a type of minimally invasive hip-preserving surgery with a stable clinical curative effect and a standard operation procedure, which could resolve above problems. FAIBG is thus becoming generally accepted by patients with early osteonecrosis [3-8]. However, FAIBG requires a difficult technique and a series of complex procedures that include the calculation of the bone mass, and the accurate implantation of the fibular screw system depends specifically on the surgeon’s clinical experience. Therefore, it is difficult to promote this procedure. Thus, the discovery of a new methodology for surgical guidance that enables accurate, safe, and easily performed surgeries will play a crucial role in the promotion and application of FAIBG. 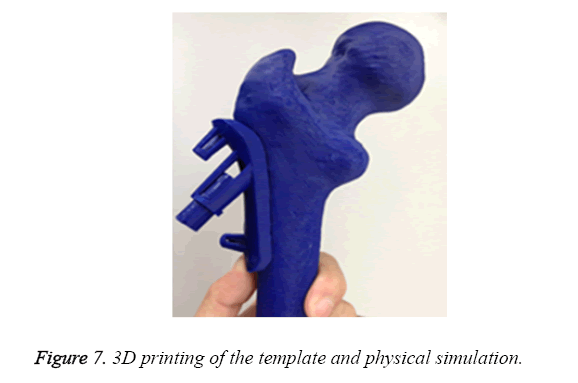 In the present paper, we design patient-specific surgical guides based on individual hip models that were reconstructed based on computed tomography and MRI by Computer Aided Design (CAD) and Computer Aided Manufacturing (CAM). The guide models were not only used to perform virtual simulations of the orthopaedic surgeries but also to make medical devices via a rapid prototyping machine for physical simulation. The operation times, the blood loss volume, the operative incision size and the mean hospital stay were computed and analysed. From September 2013 to July 2014, one surgeon performed FAIBG on 10 patients (4 males and 6 females), diagnosed with ARCO II FHN using patient-specific surgical guides. The average age was 40 years (range, 35-50 years). All patients underwent preoperative X-ray examinations and CT and MRI scans. Before the surgeries, we performed preoperative planning with the patient-specific surgical guides, and the lengths of the bone tunnel, bone mass, volume percentage, and percentage by surface area were measured. After the surgeries, we compared the operating times, blood loss volumes, and operative incision sizes with those associated with the traditional method. For the purposes of this study, the pathological models were reconstructed based on the subjects’ CT and MRI datasets. These datasets provided CT slices at 0.5 mm intervals and were used to identify the anatomical structures of the femur (i.e., the cortical and cancellous bone as shown in Figure 1a. In addition to the CT scans, MRI datasets of the same subjects were also available. The MRI datasets provides slices at 0.5 mm intervals and were used to identify the anatomical structures of the lesion (Figure 1b). Figure 1. Boundary extraction. (a). CT scan of a hip bone. (b). MRI scan of a lesion. To obtain the detailed features of the complex FHN model, the CT and MRI datasets were separately imported into the Mimics 15.1 software (Materialise co., Belgium). First, the contours of the outer cortex and the boundary of the cortical and cancellous bone were extracted from the CT datasets via automatic segmentation. This set of contours was used to create three-dimensional surface models for each bone (Figure 2a). Second, the perimeter of the necrotic bone was identified from the MRI datasets via manual segmentation and used to reconstruct a three-dimensional surface model (Figure 2b). All of the surface models were exported as separate STL files and imported into the Rapidform XOR3 software for rendering as an intact model of the FHN. The “align between scans data” command of Rapidform XOR3 enables the alignment and integration of two or more scan datasets to create a complete complex model that must be captured with multiple scans. In a reference window and a moving window, the bony landmarks were manually selected at corresponding points to match the necrotic region to generate a pathological FHN model (Figure 2c). Figure 2. Bone tissue reconstruction. (a) Surface model of a hip bone. (b) Surface model of a lesion. (c) An intact FHN model. The geometry of the patient-specific surgical guide was designed with a Reverse Engineering (RE) tool according to the FHN models described above (Figure 2). First, we specified a distance of 4 mm as an offset from the cortical surface for the thickness of the template. Second, the greater trochanter and the intersection (i.e., the intersection of the femoral axis and the axis of the neck) were connected to form the upper boundary. The femoral stem axis was used as the internal boundary in the front views. The height of the guide was 65 mm. The extras part along the boundary line was cut. Third, the femur was divided into two mesh parts from the fundus of the neck of femur using the “Region Group” function, and a cylinder was then extracted from the mesh part of the head and neck as a primitive solid feature. A reference vector (Figure 3a) confirmed that the direction of the fibular graft overlapped with the centre axis of the cylinder. A smaller cylinder representing a virtual fibular allograft was implanted into the correct position (Figure 3b). Fourth, a positioning column was designed as a pour ladder platform. This column contained three windows and one tunnel according to the smaller cylinder, the height of which 25 mm. In the upper and lower boundaries of the template, three smaller positioning columns were designed for fixing the template with the gram needles. At this point, a safe, accurate and simple system for positioning fibular grafts on a femur surface model had been developed (Figure 3c). Figure 3. Surgical guide design. (a) The centre axis of the femoral neck. (b) Correct position of the virtual fibular allograft. (c) A patient-specific locating system. a) The size of the lesion and the volume percentage of the necrotic bone to femoral head are considered important factors for predicting the FHC in the early stages of osteonecrosis [9-11]. Some authors have reported that lesion volumes greater than 30% in the femoral head are associated with a risk of collapse of 80% [12,13]. 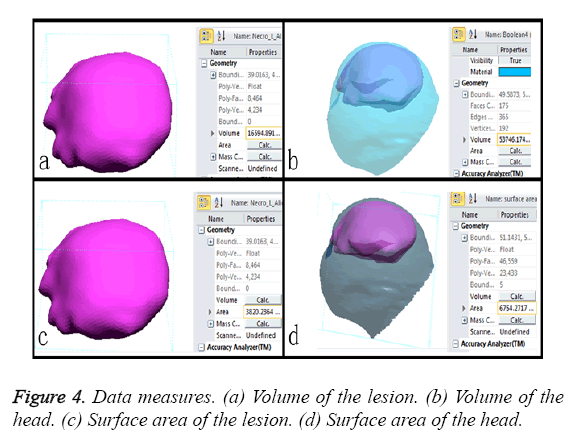 In this study, the volumes of the lesion region and the total head (Figures 4a and 4b) were calculated with a computer. The volume percentage in each case was greater than 30%. Therefore, open surgeries were needed to prevent FHC. Figure 4. Data measures. (a) Volume of the lesion. (b) Volume of the head. (c) Surface area of the lesion. (d) Surface area of the head. b) The outcome of osteonecrosis of the femoral head is influenced by percentage by surface area of the lesion . Percentages exceeding 33% in early-stage osteonecrosis patients are associated with a high risk of collapse. In this study, the surface areas of the lesions (Figures 4c and 4d) were measured, and all cases were greater than 33%. Therefore, the treatments involved surgery. c) First, we identify the position and orientation of the bone tunnel (virtual fibula, Figures 5a-5c) and measure its length (117 mm, the length of allogenic graft we selected is 80 mm; Figure 5d). This measure is a great aid for performing the operation more effectively. Next, the size and shape of the allogenic cancellous bone that was grafted into the bone tunnel between the cortical bone and the top end of the fibular graft were identified. The distance of the cortical from the fibula was 5 mm (Figure 5e). This measure is a great aid for the precise calculation of the allogenic cancellous bone mass. Finally, the screw should be implanted parallel to and locked with the fibula (Figure 5f). Figure 5. Positions. (a/b) Front view of the surgical guide. (c) Side view of the surgical guide. (d) Length of the tunnel. (e) Distance from the fibula to the cortical bone. 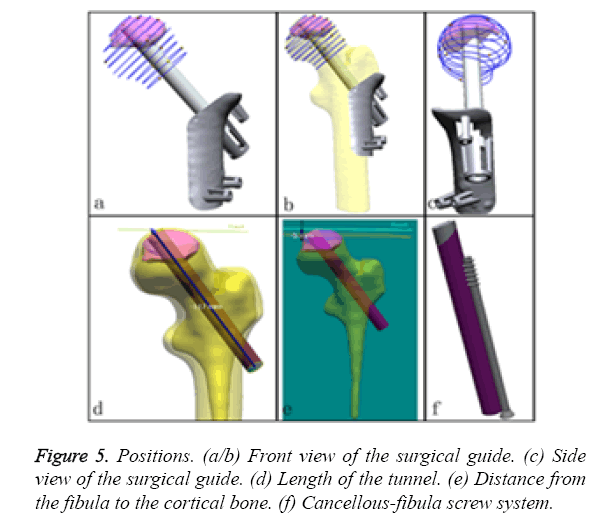 (f) Cancellous-fibula screw system. a) Impacting bone can enhance the osteoinductive process via filling with allografted cancellous bone [15-17]. In this study, the patient-specific surgical procedure was used to gain access to the necrosis lesion centre to construct bone conduction paths. After fixing the surgery guide system to the femoral cortical bone, the bone was drilled through the guide of the patient-specific template. Next, the impacting bone is simulated by constraining the attachment contour profile of the cancellous allograft to overlap with the shape and place as highlighted in Figure 6a. Figure 6. Visualization simulation. (a) Shape and location of the cancellous allograft. (b) Fixation and locking of the fibula with a screw. b) Fibular grafting can offer improve mechanical elements . After impacting the bone, one corner of the fibula is cut, and fibular grafting is mimicked by constraining the attachment centre axis of the bone tunnel to 80 mm in length and 6 mm in radius to overlap the inner face of the bone tunnel. c) A compression screw is used to control the compression of cancellous-fibula to aid the creeping substitution at the osteosynthesis site. Simultaneously, this method affords increased resistance of the osteosynthetic to detachment. In this study, fixation with a 75 mm long compression screw with 0.1 mm of screw pitch was simulated to fix the fibular graft as highlighted in Figure 6b. Ten surgical guides of STL format were input into pre-processing program of the 3D printer (Objet 260, Israel), respectively. The acrylate esters were used as model materials and support materials. After medical consumable materials assessment, ten surgical guides were printing for operation practice (Figure 7). Figure 7. 3D printing of the template and physical simulation. To realize this planning in the operating room in a safe and efficient fashion, we are working to apply the principles to the design of the patient-specific surgical guide and the preoperative planning simulation of impacted bone grafts and fibular grafting. To evaluate the results of our preoperative approach, we compared the operation time, blood loss volume, operative incision size and the mean hospital stay duration. In this study, ten fibula allograft and screws were placed in 10 patients. All of the implants were successfully placed using patient-specific surgical guides. After the application of the patient-specific surgical guides, the operation times were 53-75 min (In average 68.6 min), the blood loss volume was 90-150 ml (In average 120 ml), the operative incision size was 5-7 cm (In average 6.4 cm), and the mean hospital stay was 13.2 days. All cases were followed up for 12 to 30 months (In average: 20.4 months). All patients had no any complications of rejection and fracture of fibular allograft, infection and protruding of the cartilage over neighbouring surfaces. These results indicated that the application of the patient-specific surgical guides reduced the operation time, amount of bleeding, operative incision size and the mean hospital stay compared with the conventional method. Moreover, all of the details were quantified and the surgeon possessed an answer for every aspect of the surgical procedure. FAIBG represents an alternative to THA for the young with FHN in the early stage. As FAIBG becomes more widely practiced and both the theory and technique of hip-preserving methods for femoral head necrosis develop over the years, the demands for fibular location accuracy and bone mass calculation precision will rapidly increase. Moreover, the blood loss volumes and X-ray radiation exposure will decrease. One goal of the patient-specific surgical guide is enable surgeries that are precise yet easy to execute. It has been suggested that the accurate positioning of the fibula is extremely important for the support of the femoral head because the trabecular bone materials become soft, which results in the degradation of the structural strength and a consequent increase of the risk of collapse. Only sufficient hardness can provided improved biomechanical support. In this study, we remove the sequestrum along the bone tunnel and impacted the bone graft to enhance the bone strength. Consequently, the femoral heads were nearly restored, and initial stability was achieved  to provide a proper biomechanical environment for the repair of necrosis. Both the bone conduction paths and the stability of the inner femoral head were reconstructed via allogeneic fibular grafting, which can slow or even halt the progression of necrosis and improve the function of the hip and the quality of life of patients with femoral head necrosis . In this study, we mimicked impacted bone grafts and the fibular grafting operation by designing and generating patient-specific guide models for physical simulation via the CAM technique. The tunnel length, cancellous allograft shape, volume and surface area were measured for quantitative determinations. The experimental results revealed that this new patient-specific preoperative methodology is significantly beneficial to the successful performance of FAIBG. Moreover, this methodology reduced the operation time, the blood loss volume, the operative incision size and the mean hospital stay duration compared with the reported values for these parameters [21,22]. The application of this methodology will become popular in the field of hip-preserving surgery. CAD/CAM is currently extensively used in surgical simulations, medical implant design and manufacturing [23,24]. The individual templates enabled by CAD provide a precise location of the lesion that satisfies actual clinical needs. Using this virtual environment, we improved the predictability and quality of our surgeries by accessing important data prior to the operations. Therefore, CAD plays an important role in preoperative planning and provides a new approach for optimizing operative schemes. In addition to CAD, CAM can aid the production of material objects to provide a reusable environment for surgical training, planning and rehearsal. This patient-specific surgical guide may enable more intuitive and precise preoperative planning for hip-preserving surgery in terms of the flexibility of movement and rotation for surgical simulation and the ease of measurement and computation for quantitative determination. Moreover, this guide may help surgeons to improve their techniques for choosing the optimal scheme and fine-tuning that scheme, which will reduce surgical trauma. Therefore, this new preoperative planning approach deserves further study. All authors contributed to the conception and design of the study, analysis and interpretation of data, as well as drafting and revising the manuscript for intellectual content. In support of the research of preparation of this manuscript, the authors received grants from National Science Foundation of China (81473704) and Natural Science Foundation of Henan Province (2014ZY02094). None of the authors of this paper have any financial and personal relationships with other people or organizations that could inappropriately influence the work. Lieberman JR, Berry DJ, Mont MA, Aaron RK, Callaghan JJ. Osteonecrosis of the hip: management in the 21st century. Instr Course Lect 2003; 52: 337-355. Garberina MJ, Berend KR, Gunneson EE, Urbaniak JR. Results of free vascularized fibular grafting for femoral head osteonecrosis in patients with systemic lupus erythematosus. Orthop Clin North (Am) 2004; 35: 353-357. Lowrie AG, Rao K, Nanu A, Erdmann MW. Reversed flow lateral circumflex femoral vessels as recipients for free fibular grafting in treatment of femoral head osteonecrosis. Microsurgery 2010; 30: 19-23. Marchant MH Jr, Zura RD, Urbaniak JR, Aldridge JM 3rd. Hip incision planning for free vascularized fibular grafting of the proximal femur: a handy tip. J Surg Orthop Adv 2007; 16: 204-206. Guo XZ, Dou BX, Zhou YX, Li YJ. Surgical treatment of necrosis of the femoral head in early stages with core depression and allo-fibular grafting. Chinese J Rep Reconstr Surg 2005; 19: 697-699. Zhang CQ, Ceng BF, Sui SP, Yuan T, Xu ZY, Shao L. Surgical technique of modified free vascularized fibular grafting for treatment of osteonecrosis of the femoral head. Chinese J Rep Reconstr Surg 2005; 19: 692.696. Liu X, Sheng J, Zhang C. Applied anatomic study on vascularized fibula graft with unilateral fibula as the donor for bilateral femoral head necrosis. Int J Orthop 2011; 32: 189-201. He W, Li Y, Zhang Q, Wang H, Fang B, Pang Z. Primary outcome of impaction bone grafting and fibular autograft of allograft in treating osteonecrosis of femoral head. Chinese J Rep Reconstr Surg 2009; 23: 530-533. Hernigou P, Lambotte JC. Volumetric analysis of osteonecrosis of the femur. Anatomical correlation using MRI. J Bone Joint Surg Br 2001; 83: 672-675. Kishida Y, Nishii T, Sugano N, Nakanishi K, Sakai T, Miki H. Measurement of lesion area and volume by three-dimensional spoiled gradient-echo MR imaging in osteonecrosis of the femoral head. J Orthop Res 2003; 21: 850-858. Bassounas AE, Karantanas AH, Fotiadis DI, Malizos KN. Femoral head osteonecrosis: Volumetric MRI assessment and outcome. European J Radiol 2007; 63: 10-15. Nishii T, Sugano N, Ohzono K, Sakai T, Sato Y, Yoshikawa H. Significance of lesion size and location in the prediction of collapse of osteonecrosis of the femoral head: a new three-dimensional quantification using magnetic resonance imaging. J Orthop Res 2002; 20: 130-136. Shi ZC, Li ZR, Sun W, Zhang XZ, Wang W, Huang ZG. Volumetric measurement of osteonecrosis of the femoral head using computerized MR and primary mechanical test. Chin J Radiol 2006; 40: 288-292. Zhao F, Li Z, Zhang N, Shi Z, Zhang X. Calculation of articular surface area of osteonecrosis and its application in predicting collapse of the femoral head. Zhongguo Xiu Fu Chong Jian Wai Ke Za Zhi 2005; 19: 687-691. Mont MA, Jones LC, Hungerford DS. Non-traumatic osteonecrosis of the femoral head: ten years later. J Bone Joint Surg Am 2006; 88: 1117-1132. Aldridge JM, Urbaniak JR. Avascular necrosis of the femoral head: role of vascularized bone grafts. Orthop Clin North Am 2007; 38: 13-22. Korompilias AV, Lykissas MG, Beris AE, Urbaniak JR, Soucacos PN. Vascularised fibular graft in the management of femoral head osteonecrosis: twenty years later. J Bone Joint Surg Br 2009; 91: 287-293. Plakseychuk AY, Kim SY, Park BC, Varitimidis SE, Rubash HE. Vascularized compared with nonvascularized fibular grafting for the treatment of osteonecrosis of the femoral head. J Bone Joint Surg Am 2003; 85-85A: 589-596. Delloye C, Bannister G. Impaction bone grafting in revision arthroplasty. New York Marcel Dekker 2004: 84-92. Yin S, Zhang C, Jin D, Chen S, Sun Y. Treatment of osteonecrosis of the femoral head in lymphoma patients by free vascularised fibular grafting. Int Orthop 2011; 35: 1125-1130. Zhang C, Zeng B, Sui S, Yuan T, Xu Z. Surgical technique of modified free vascularized fibular grafting for treatment of osteonecrosis of the femoral head. Zhongguo Xiu Fu Chong Jian Wai Ke Za Zhi 2005; 19: 692-696. Mao H. Analysis of modified free vascularized fibular grafting for the treatment in patients with avascular necrosis of femoral head. Chin J Prim Med Plarm 2008; 15: 1475-1476. Sun W, Starly B, Nam J, Darling A. Bio-CAD modelling and its applications in computer-aided tissue engineering. Comp Aid Des 2005; 37: 1097-1114. Lal P, Sun W. Computer modelling approach for microsphere-packed bone scaffold. J Comp Aid Des 2004; 36: 487-497.